Been to Bali more times than you can count? Have the United States lost their shine? Or do you just really need a holiday? Well, you’ve come to the right place, my friends! 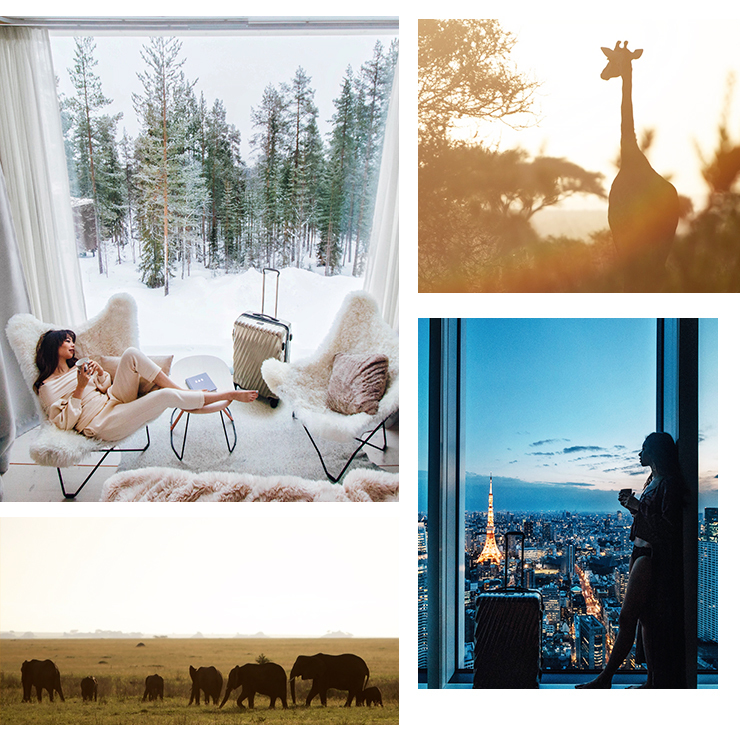 We’ve teamed up with TUMI, makers of premium travel, business and lifestyle accessories, to bring you all the places you need to visit this year, plus the top things to do while you’re away. Before you set off on your adventure, be sure to check out TUMI’s latest luggage collection, 19 Degree. Featuring a cutting edge design and meticulously crafted aluminium, 19 Degree is the pinnacle of travel gear. Having the right luggage is key to an easy breezy holiday, so whether you’re jetting off to Tokyo, Tanzania or Tassie, if you’ve got TUMI in tow you’re onto a good thing. Now, which place to choose? Tucked away in the Sunshine Coast Hinterland, Maleny is a delightful little town perfect for weekend getaways. 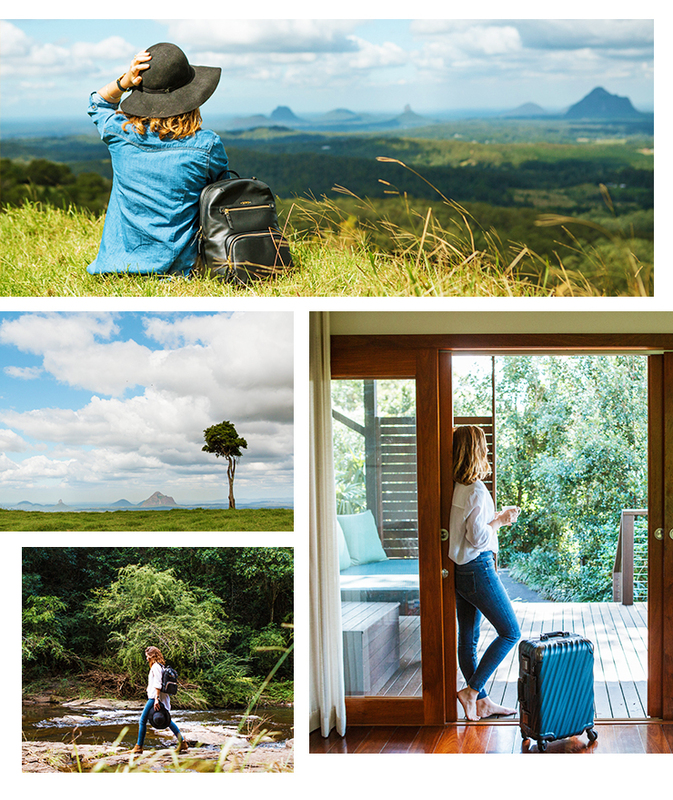 While the drive there is stupidly stunning (we recommend tracing the Blackall Range through Mapleton and Montville), Maleny itself is even more beautiful, with plenty of natural wonders, delicious food and even better wine. Things to do: Swim in the waterhole at Gardners Falls, eat the creamy cold stuff at Maleny Food Co., go antique shopping, chill out at the Maleny Botanic Gardens, spend a day at Australia Zoo nearby, wander through Mary Cairncross Scenic Reserve, go on a cheese crawl, stop by the cutest bookstore ever and relax at Spicers Tamarind Retreat. Half way between Darwin and Adelaide, Alice Springs is just about as remote as you can get, the perfect place if you’re hoping to escape from the craziness of everyday life. It’s mostly about the scenery and history in this red dirt town smack bang in the middle of Australia, but it’s also got its fair share of cute cafes and bars. Things to do: Obviously take a trip out to Uluru, or head north (on a frankly epic Alice to Darwin road trip) and visit Litchfield National Park and stop by Florence Falls and Buley Rockhole while you’re there, swim in the Mataranka hot springs, enjoy the fun, circus vibes at Montes and go hot air ballooning or quad biking. We’ve all said at some point that we want to visit Tassie and 2017 is the year for it. Launceston sits on the northern tip of this heart-shaped state and is known for its food, wine, culture and incredible scenery. Things to do: Visit Cataract Gorge which is just two minutes from central Launie, down some delicious beer at Boag’s Brewery, check out Ben Lomond National Park, smell the lavender in Nebowla’s Brisestowe Lavender Estate, head out on a winery tour and hike Cradle Mountain. A three-hour red dirt drive from Broome in Western Australia, Cape Leveque is worth the extra effort to get to. Imagine bright red pindan leading into white sandy shores and bright blue water and you’re half way there. Things to do: Make a beeline for Kooljaman where you can glamp in deluxe safari tents with stunning views, follow a local to Hunter’s Creek hearing all the ancient stories and tasting bush fruit along the way, go fishing off the Dampier Peninsula and hire a bush butler for an evening. Yet another picturesque spot in Australia, Perisher Valley is an adventurer’s playground. During the winter months it’s all about the snow sports, but once the snow starts to melt it opens up the door for bushwalking and mountain biking. Things to do: Go skiing or snowboarding at Perisher, ride on Australia’s only alpine railway, check out Smiggin Holes whether there is snow there or not, take a break in Guthega village, try your hand at fly fishing and kick back at The Overflow Bar. Yet another European city to put on your list (and make deciding where to go even trickier), we’re dubbing Helsinki as the new Stockholm. Home to plenty of history, pretty parks and good food, as well as some stunning natural wonders nearby (and the opportunity to see the Northern Lights), it’s crazy to think this place isn’t higher up on everyone’s bucket lists. Things to do: Take in the hodge podge of architecture in the city, do yourself a favour and visit the Temppeliaukio church (it’s set in solid stone), check out the UNESCO listed Suomenlinna fortress, take a breather in the Kamppi Chapel of Silene, dine in Michelin-starred Olo and if you have a few extra days up your sleeve take a short flight up to Ivalo and stay in an Igloo at Kakslauttanen Arctic Resort. Technologically advanced, yet deeply rooted in the past, Tokyo is a melting pot of experiences. From the electronic goods district of Akihabara to old Tokyo’s Asakusa, you’ll never cease to be amazed at what this intriguing city has to offer. Things to do: visit a cat cafe, check out the traditional Japanese gardens of Rikugien, be blown away by the LED screens lining the streets of Shibuya (aka Tokyo’s Times Square), get your kawaii on in Harajuku, eat at a crazy themed restaurant (like this one) and squeeze in a visit to Tokyo Disney Sea. Thanks to Trump, America’s appeal has dropped slightly, but that opens up a new door—to Canada. With a mostly French-speaking population, Quebec offers up quaint architecture, delicious Euro-inspired food and plenty of maple syrup (they’re the world’s largest producer). Things to do: Eat as much poutine as you possibly can, go ice fishing or snowshoeing, visit the world’s most photographed hotel (Le Chateau Frontenac), stroll through Battlefields Park, marvel at Montmorency Falls or the Citadelle of Quebec and go for a wander in Le Quartier Petit Champlain. Home to The Serengeti and Kilimanjaro national parks, Tanzania is the perfect destination for adventure goers. Hop on a safari and track down elephants, lions, leopards, buffaloes and rhinos (or the Big Five, for those of you playing at home), then enjoy some much needed rest and relaxation at the nearby tropical island of Zanzibar. Things to do: Set out on a Safari in the Serengeti, climb Mount Kilimanjaro, stay in an underwater room in Zanzibar, check out the Ngorongoro Crater (and gaze in awe at the pink flamingoes), go scuba diving off Pemba Island, visit Stone Town and get up close and personal (but not too close) with the chimps in the Gombe Stream National Park. One of the most beautiful places you’ll likely ever lay eyes on, once you arrive on Moorea you will never want to leave. Floating in the South Pacific, right next to Tahiti, this stunning island is home to volcanic mountains, clear, azure waters and white sandy beaches, as well as some of the nicest inhabitants. Things to do: Go dolphin and whale watching, hike Three Coconut Trees Pass, take in the sights from Belvedere Lookout, snorkel with the stingrays or dive with the sharks, tour a pineapple plantation and, most importantly, stay in an over water bungalow. Editor’s note: This article is proudly sponsored by TUMI and endorsed by The Urban List. Thank you for supporting the sponsors who make The Urban List possible. Click here for more information on our editorial policy.